Note: SammyNetbook.com has since been moved to WordPress with an e107 powered forum. The forum is powered by vBulletin. My main e107 driven site, www.sammynetbook.com has just seen a 20% rise in traffic. 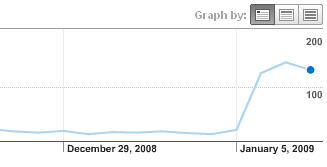 And how did I increase my traffic rankings by this much? Easy! Just get onto the first page of Google! I have learnt the real secret of this site’s success is pretty much down to luck. I was the first in there with an approachable friendly forum that was able to answer questions. Once the momentum got going I had an endless source of topics and information coming through the forums providing great content for new NC10 owners. This in turn attracts more people. 3 months in and we have 1200 members and a million page views! e107 has provided a great platform for this site. There are a few things that I would like to change but on the whole the user feedback is positive. It shows that e107 can handle a site of this nature just fine. I would like to see improved URL structure and forum controls and thankfully these are both planned for e107 0.8 – the new release hopefully out in 2009. Following the e107 forums it seems that it is gathering momentum and that the developers involved are committed to getting out a quality release that will once again put e107 up there with Joomla and Drupal, etc. e107 is already far easier to use than the aforementioned CMS systems, so with a bit of polish it should be a leader in its field!